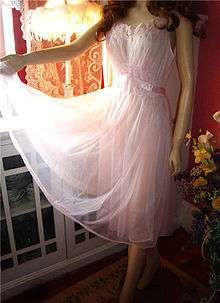 A nightgown may have any neckline, and may have sleeves of any type, or be sleeveless, and any shoulder strap or back style. The length of a nightgown may vary from hip-length to floor-length. 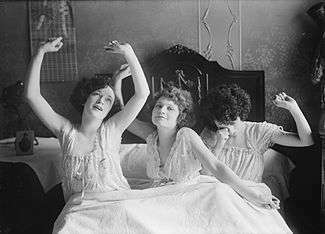 A short nightgown can be called a "shortie" or a "babydoll", depending on the style. 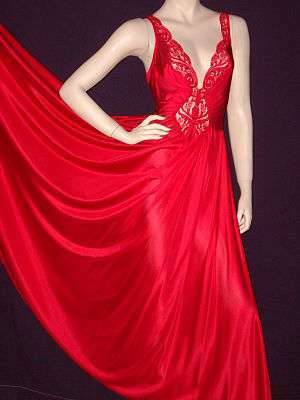 The sweep (taper from top to bottom) of the night gown can vary from virtually straight, to full circle sweep, like the Olga gown pictured below. A slip nightgown may be used as a nightgown or as a full slip. Nightgowns may be worn with a matching outer garment, a robe, sheer chiffon peignoir or dressing gown, to make them appropriate for receiving guests. The Workwoman's Guide, which was published in London in 1838, describes various types of nightgowns. High-collared style gowns were more prominent in that era. The nightgown acquired more prominence during the Victorian Era. From that very early stage, nightgowns were increasingly being used to keep one on winter nights and as a stylish home wear as well.